It’s been widely reported that among the FTSE 100, there are more CEOs named David (nine), than CEOs who are women (seven). The problem, of course, is not David (any of them), but Goliath – in this case, not one massive adversary but a number of challenges faced only, or disproportionally, by female CEOs. For example, women CEOs face more shareholder activism than their male counterparts according to an article in the Journal of Applied Psychology. But why? Shareholder activism is usually a sign of lack of confidence in management, and management’s ultimate leader, the CEO. Assuming shareholders are rational actors, that lack of confidence came from somewhere. In the case of female CEOs, the “somewhere” might not be hard to find. Women CEOs face more shareholder activism than men. The reasons why may outnumber the women themselves. It’s entirely possible – and let’s hope probable — that the shareholder response is not merely because women CEOs are women. But, it is possible that a collection of individual biases against women CEOs exist, and while each of those biases might be unfair or illogical, together they create a negative perception. Women CEOs face multiple challenges that can help create an overall picture that would lower confidence. For example, the announcement of a woman CEO is more likely to be followed by a drop in share price, women CEOs experience more negative media coverage, women are more often appointed CEOs of companies that are struggling, and women are underrepresented at the board level (which greatly impacts CEO selection and support). One can imagine even a neutral shareholder receiving multiple cues that cause concern, and perception can trump reality. It’s possible that shareholder activism is kicked off almost straight away, because of the initial share price drop. That’s not an irrational response, but it also means that activism, once set in motion, is indifferent to share price increase over time. In other words, the initial rational reaction (share price drops, major shareholders panic) is followed by an irrational lack of reaction (share price increases, but activism remains). Maybe that pesky media bias plays in here – the negative stories about women CEOs (including coverage of the activism) outnumber positive stories, like, say, overall improved valuation of the company. Troubling times. Related, women are more likely to be appointed head of a company when it is in trouble. So, that makes several things true. One, a struggling company has either nervous shareholders or unsolicited suitors, or both. It’s likely that new CEOs – male and female — are under higher scrutiny and more vulnerable. Any single poor, even questionable decision tends to be weighted heavier – people fear things are bad and they’re getting worse. The tolerance for risk and innovation is much higher at companies that are performing well overall. After all, when’s the last time you heard about Google Glass? So the bias itself is not gender specific, but the situation that creates this bias is placed upon women more frequently. As if Goliath could get any bigger, there’s a small numbers problem as well – if even one woman CEO in the UK faces shareholder activism (or any negative problem), that’s one of out of seven, or 14%, of all female CEOs. It can feel like a significant or predictive percentage – whereas one male CEO (out of 93 total) is only 1.1% of all the male CEOs. Heck – even if all of the Davids were in trouble, they would still be less than 10% of all male CEOs. But enough mathematics. The point is Goliath here is a many-headed monster. 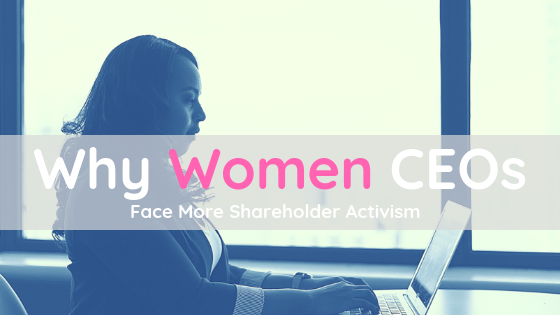 Women CEOs face more shareholder activism, but maybe not simply because they’re women. It’s possible that shareholder activism is not just a simplistic (and very bad) bias against women leaders simply because of their gender. But that means – at best — that an unbiased shareholder acts based on biased information. That’s better. Kind of. A response that is just sexism, plain and simple, is an emotional, illogical prejudice and it’s hard to change hearts and minds that don’t want to. On the other hand, taking on each of the dynamics that create the bias feels like, if not a fair fight, at least a battle worth waging. Even if you aren’t named David.